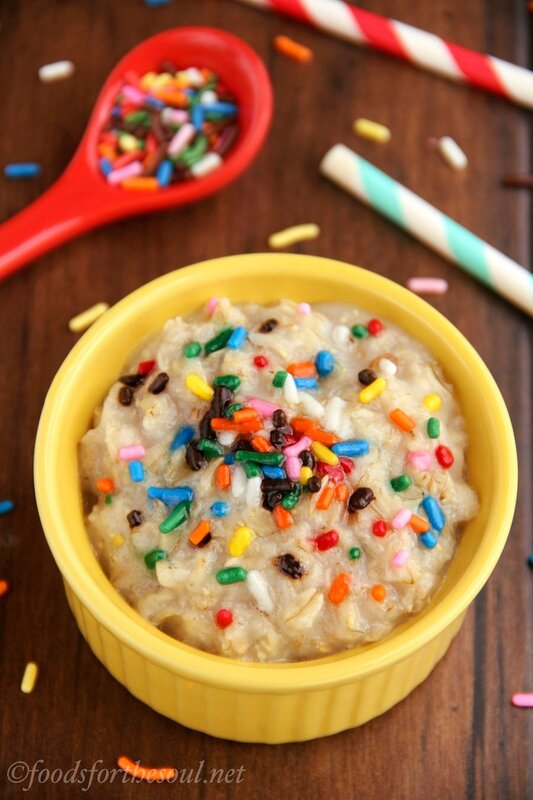 An easy recipe for a healthy breakfast that actually tastes like dessert! 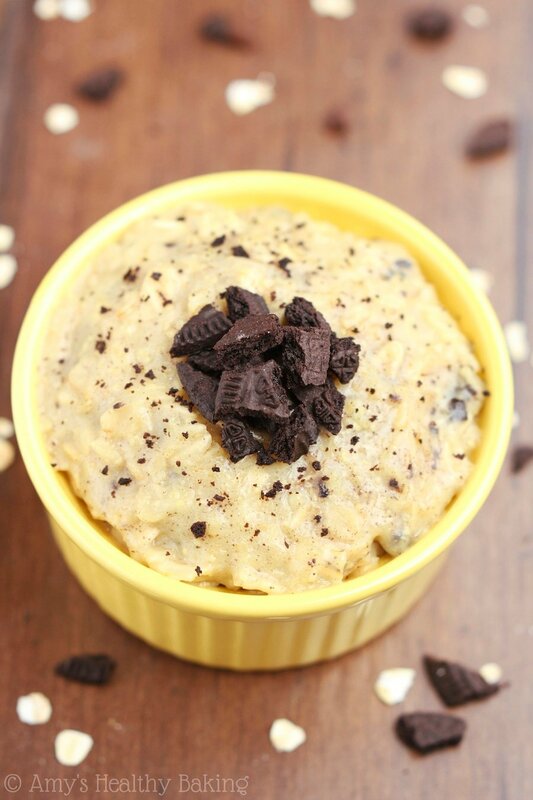 Sweet vanilla & rich chocolate cookies = the best bowl of cozy oatmeal. Last week, I jetted clear across the country to visit Miami for the annual BlogHer Food Conference. After a flight delay and lack of taxis, I arrived at the hotel at 1:30 am, but with a blog post left to publish, I slipped between the sheets after 4 and finally stopped snoozing sometime around 1 the following afternoon. While I fit in a quick workout before many of the other bloggers flew in, I listened to the heavy drops loudly pelting the gym’s windows like the constant drum roll of a snare. (With all of the wind, a tornado even touched down during that time only a mile from the airport!) Back up in my room, I showered, dressed, and headed down to the lobby in search of food. When she replied yes, we exchanged names, blog titles, and a few pleasantries before I eventually asked where she was from. And when she mentioned the city’s name, my jaw dropped to the floor. It’s a small (well, relatively, for California) 70,000-person town and nobody ever seems to be from there, let alone know where it is! So Jane took me under her wing, convincing me to join the gaggle of gorgeously dressed girls (despite my cutoff jean shorts and well-worn slightly ratty hoodie) boarding a shuttle to traverse across town for a party by reassuring me they’d serve lots of snacks and savory dishes for my growling stomach. And she continued to watch over me for the entire Conference, making sure I was never lonely, met all the right people, and stayed very well fed. By the time I boarded the plane to fly home yesterday, our easy friendship felt as comfortable as if we’d known each other for years. It was a sweet surprise to meet someone that kind and generous from my hometown! 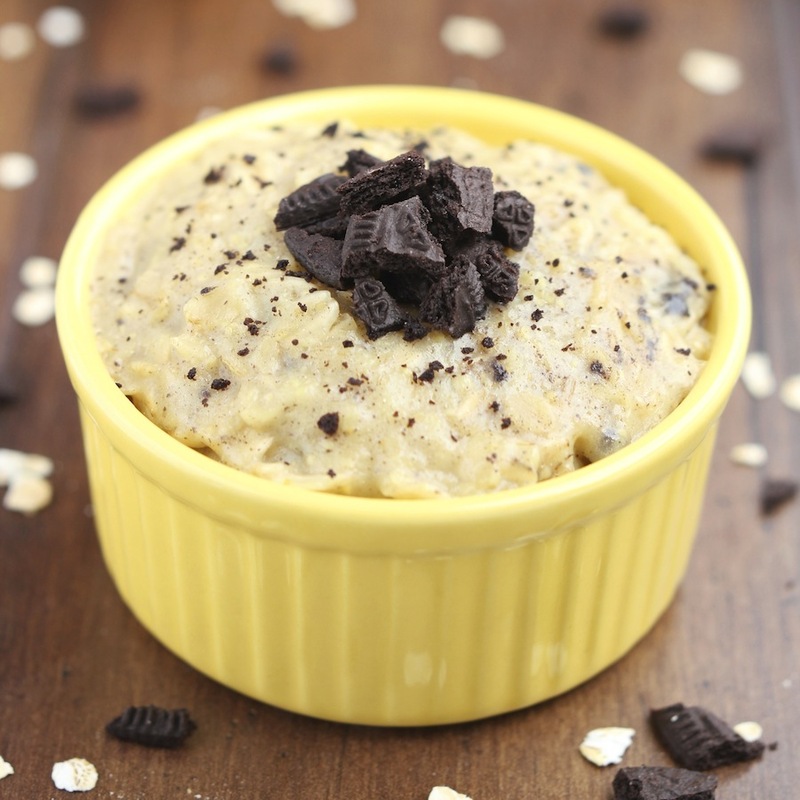 Just like Jane, this Skinny Cookies ’n Cream Oatmeal is also a sweet surprise! 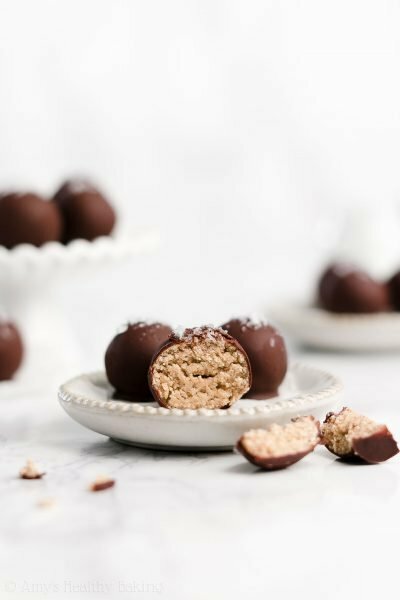 Its thick, smooth texture—almost reminiscent of soft scoops of ice cream, minus the melting—and rich chocolate cookie crumbles will tempt you to jump out of bed in the morning just to eat a bowl for breakfast. Despite its classic dessert taste, this oatmeal is still loaded with protein and ready in less than 5 minutes! 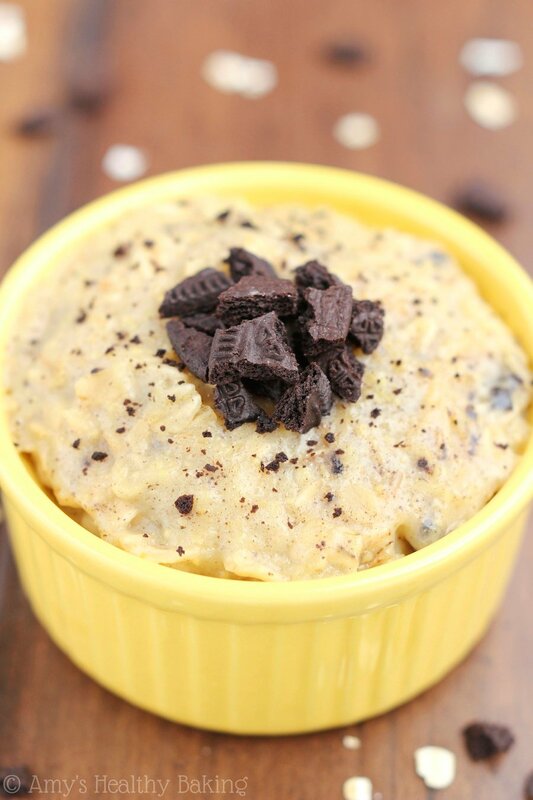 You guys loved my skinny chocolate chip cheesecake oatmeal so much that I couldn’t resist creating another fun flavor! 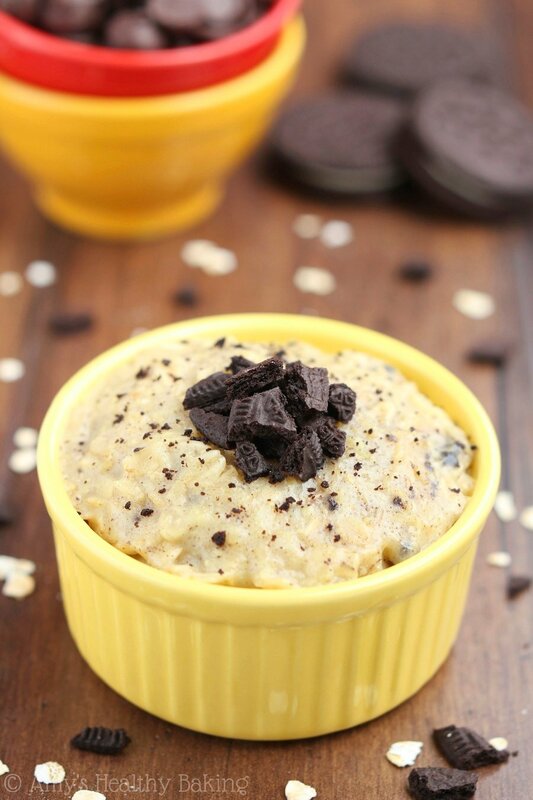 Similar to that one, you only need 4 ingredients for this easy recipe: oats, milk, pudding mix, and an Oreo. That’s it! You don’t actually prepare the fat-free, sugar-free instant pudding mix according to the package’s directions. We only need the dry powder for flavor, not thickening, because oats thicken enough on their own already. To prepare the oatmeal, stir everything together in a big bowl (or pot for the stove, if you don’t mind washing an extra dish!) except the crumbled Oreos. 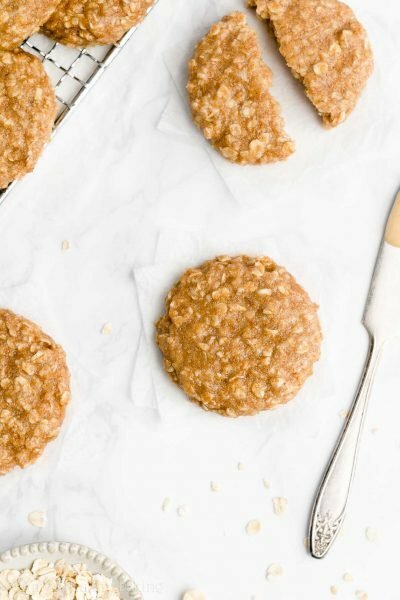 The cookies soften really quickly, so leave them out to maintain a little bit of their crunchy texture. Cook the oatmeal, stirring occasionally (this helps prevent it from bubbling over the rim! ), until it’s mostly thickened; then let the bowl sit for a few minutes to allow it to thicken a bit more. Now it’s time to dig in! If running short on time, you could even make overnight oats instead. 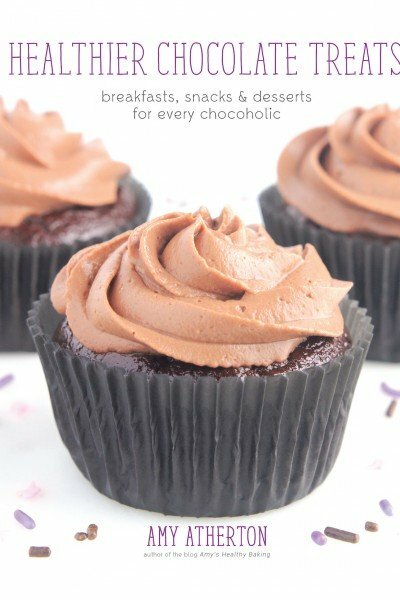 Simply add the same 3 ingredients to a small Tupperware container, seal the lid, and refrigerate overnight. 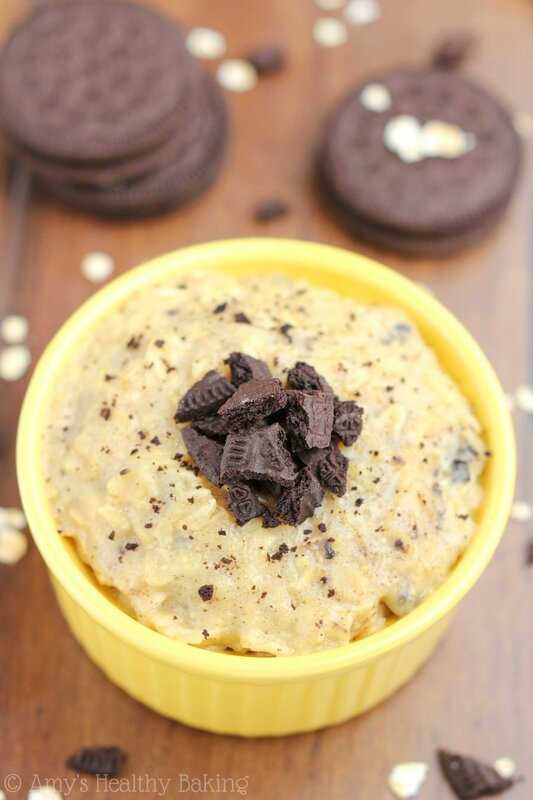 Once the oats absorb all of the liquid, stir in the Oreos, grab a spoon, and dash off to work or school with your sweet breakfast treat! 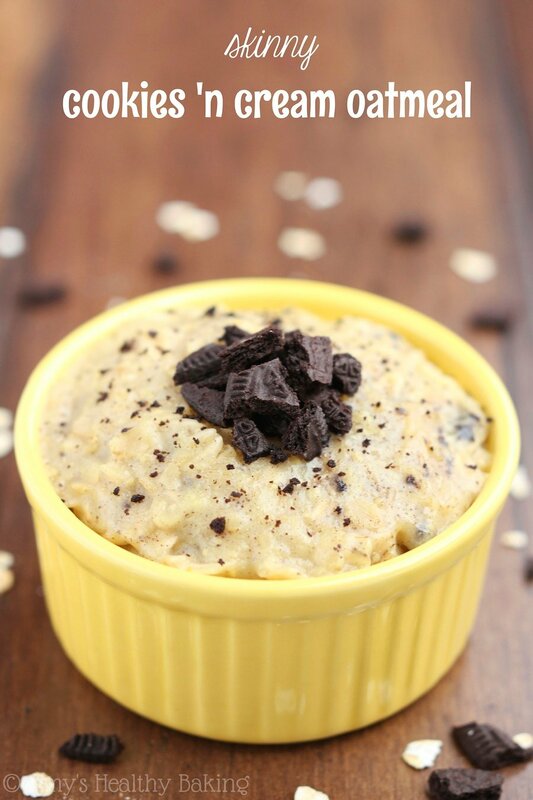 With its classic flavor combination, this Skinny Cookies ’n Cream Oatmeal is an irresistibly fun morning meal! 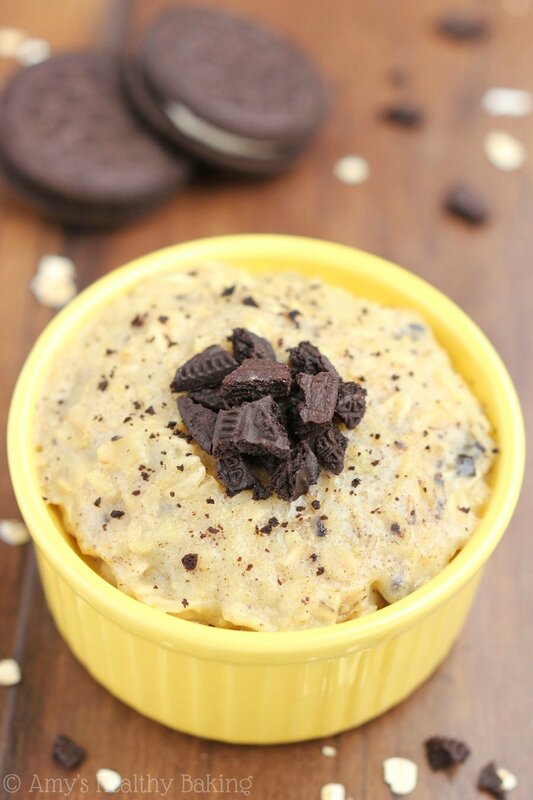 The soft oats, rich vanilla, and indulgent chocolate Oreo chunks combine together to create the most satisfying cozy bowl, yet even your mom would approve of its low-calorie profile and big protein punch. So… Who wants cookies for breakfast? 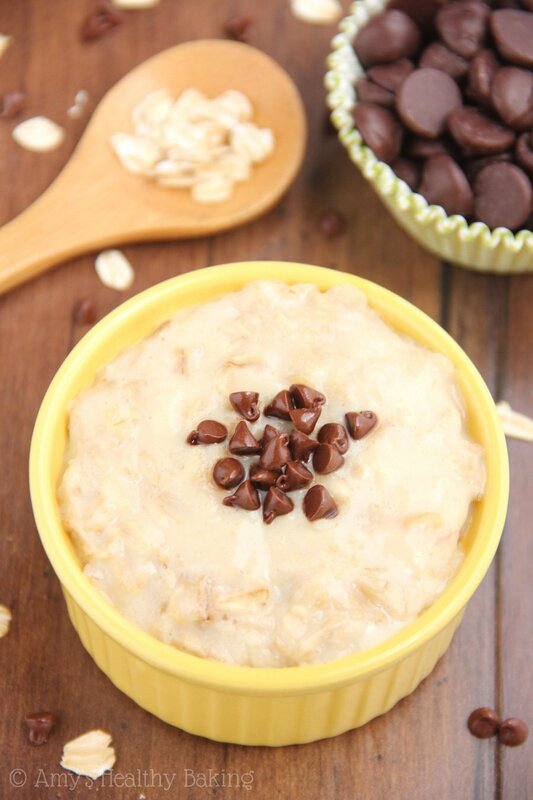 This thick and creamy oatmeal tastes like the classic ice cream flavor but is packed with protein and nutrients! The recipe is easily doubled, tripled, or even quadrupled to feed more people. 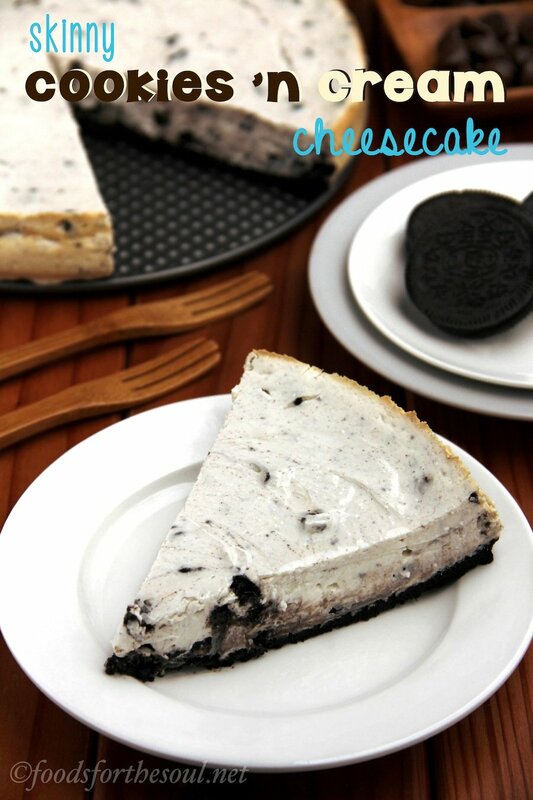 Roughly crumble the two halves of the Oreo cookie, and set aside. Add the oats, milk, and pudding mix to a large microwave-safe bowl. Stir to dissolve the pudding mix. Microwave on HIGH for 1 minute 45 seconds. Stir, and microwave again for 1 minute, stirring every 15 seconds to prevent the oatmeal from bubbling over. 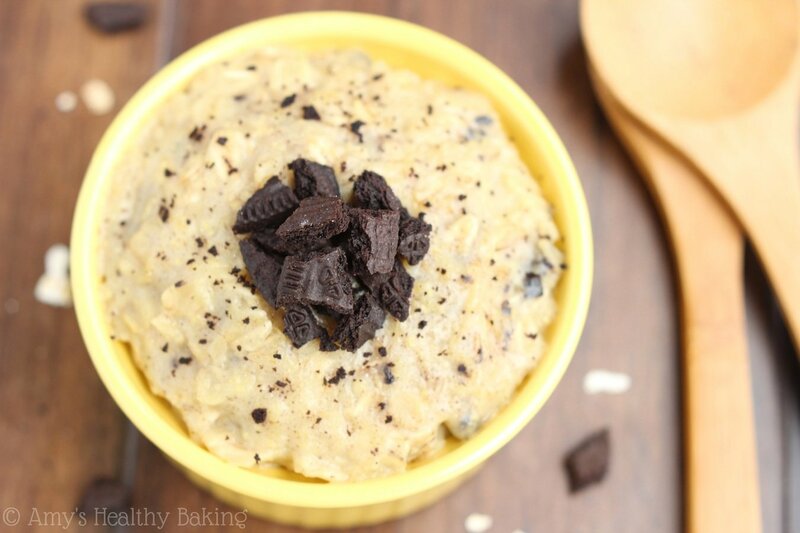 Let the oatmeal rest for 2 minutes before stirring in the crumbled Oreo cookies. 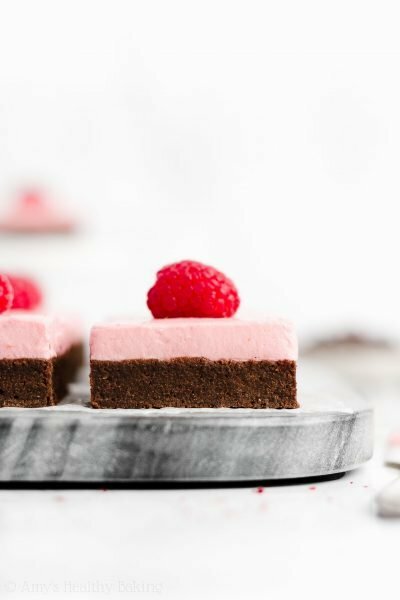 Notes: Just use the dry pudding mix! Do not prepare it according to the package directions. Alternative cooking method: Add oats, milk, and pudding mix to a small pot and cook for 4-5 minutes over low heat, stirring frequently, on the stove. For overnight oats: Combine the oats, milk, and pudding mix in a bowl or Tupperware. Cover and refrigerated for 8 hours or overnight until thickened. Just before serving, crumble the Oreo cookies and stir them in. Do you know how annoying that little hot tub is that keeps getting in the way of me being able to read your post? 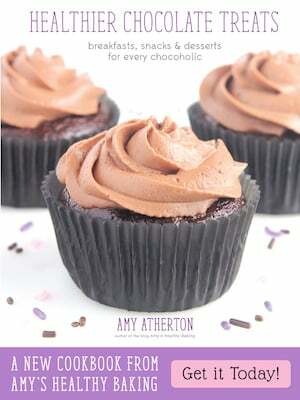 Do you think there is any alternative to using the pudding mix? I’d rather just omit it if enough vanilla extract, honey, and yogurt mixed together could capture the same flavor. I really appreciate your interest in my recipe, Sarah! 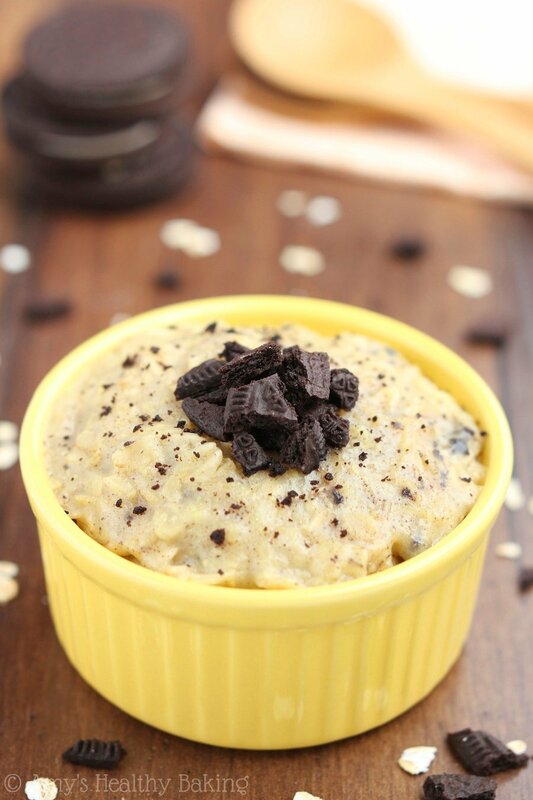 The pudding mix adds sweetness, thickens the oats, and also creates the cream-filling flavor. You can omit it if you increase the sweetener, and you’ll probably want to leave the cream filling in the Oreo as well, rather than omitting it. 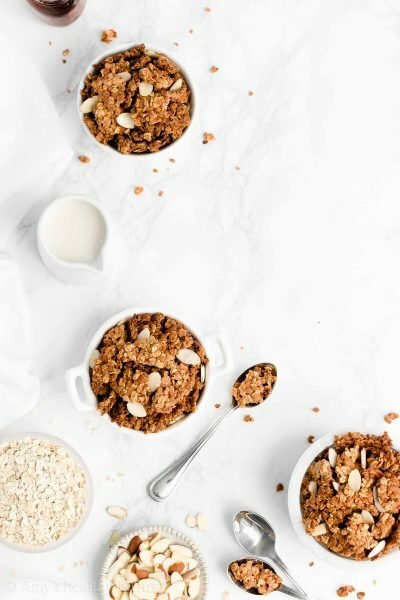 🙂 I’d love to hear what you think if you try this oatmeal!